Dr. Stuart W. Halpern, ‘10BR, ‘13A, is the Assistant Director of the Zahava and Moshael Straus Center for Torah and Western Thought of Yeshiva University, Assistant Director of Student Programming and Community Outreach at the Bernard Revel Graduate School of Jewish Studies, and Deputy Editor of YU Press. Dr. Halpern earned his BA from the University of Pennsylvania, his MA in Psychology in Education from Teachers College at Columbia University, an MA in Bible from Revel, an MBA from Touro in Nonprofit Management, and his EdD from the Azrieli Graduate School of Education and Administration. 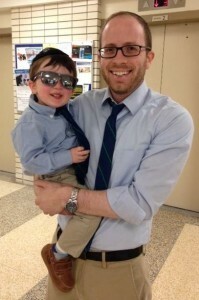 Stu wears many hats at Yeshiva University. For the Straus Center, he is responsible for the operational side of all academic programs, community events, book projects and student enrichment activities that seek to bridge the worlds of Torah and Western Thought. Stu also coordinates Revel’s joint MA/MS program with Azrieli, and spearheads event planning, marketing, and recruitment. And for YU Press, Stu co-edits the Mitokh Ha-Ohel (“From Within the Tent”) series that collects original essays on Jewish themes from rebbeim and faculty across the University, and shepherds various book projects through the production and distribution process. Stu also serves on the Steering Committee of the Orthodox Forum. Every day I am blessed to be involved with so many meaningful initiatives. Whether it’s coordinating a recent Straus Center event at a sold-out Young Israel of Jamaica Estates in which our director, Rabbi Meir Soloveichik, interviewed Lord Jonathan Sacks on the topic of religious violence, to speaking on numerous college campuses across the tristate area about opportunities for graduate study in Jewish Studies at Revel, to helping edit upcoming books on topics ranging from early American history to contemporary works of Jewish thought, there is always so much work to be done, but it is an honor to be doing it. What is the mission of the Straus Center and why was it established? The Straus Center was established to help develop Jewish thinkers and wisdom-seeking Jews by deepening their education in the best of the Jewish tradition, exposing them to the richness of human knowledge and insight from across the ages, and confronting them with the great moral, philosophical, and theological questions of our age. I strongly encourage people to learn more about us by visiting yu.edu/straus (our website is great and has multiple resources, from syllabi for our courses to videos of many of our public events). How do you maintain a relationship with all of your students once they graduate? On the Straus side of things, we have run events for alumni including a Hanukkah party and private author conversation with Yossi Klein Halevi in which he discussed his award-winning Like Dreamers and more recently had an event in which two of our distinguished alumni spoke to the Honors program about their doctoral research in Yale and Princeton. On the Revel side, there are also many occasions in which we engage with our alumni, including the yearly Shabbaton and multiple events, both on campus and in various local communities, throughout the year, which provide us with ways to continue connecting with former students. It might not be super surprising because I talk about these things all the time, but I am an obsessive consumer of action movies and British TV shows, as well as books on academic Jewish studies. I also recently purchased my first scooter only to learn that my 3 year old son is much better at scooting than I am.